Syria Civil Defence, known as The White Helmets, are volunteer rescue workers who have saved thousands of people from the rubble of air attacks. After Assad’s forces again attacked civilians with chlorine bombs on 16th of March, Syria Civil Defence called on UN Security Council members to enforce a no-fly zone. If you live in the UK, this page can help you write an email to your MP. 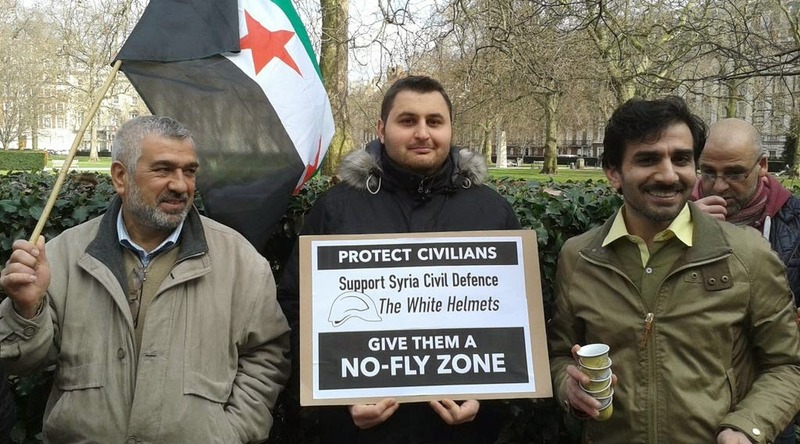 Please ask your MP to support The White Helmets in their call for action to end Assad’s air attacks. Photo above: Kafranbel protesters call for a No-Fly Zone, 21 March. More here. Below: London protest outside the US Embassy, 22 March. More here.